A fascinating piece in the Guardian today about an FAO policy paper on the eating of insects. Apparently, senior figures in the UN and elsewhere are looking for ways to boost consumption of creepy-crawlies as a means of reducing greenhouse gas emissions. Rearing livestock such as cows, pigs and sheep guzzles agricultural land and spews out 20% of global greenhouse gases, and so we all need to start eating less meat. Insects, it seems, are a promising alternative, since they are rich in protein, vitamins and minerals, and breeding them produces far less pollution than breeding conventional meat animals. The only problem, according to the experts cited in the article, is the Western taboo on eating insects. If you are interested in this subject, I heartily recommend this extraordinary book by the Victorian Englishman Vincent Holt, which deploys powerful, rational arguments in favour of eating insects – and offers some recipes that sounds rather interesting. It’s a delightful, amusing and provocative little book. You might also like to read my thoughts on the subject in a piece for the FT a few years ago, which is on this website. The photographs that accompany this post are of some of the ingredients (raw and cooked) on the menu of Zou Haikuan’s restaurant, which is mentioned in my article. I certainly agree with Vincent Holt that it’s completely irrational to eat shrimps and oysters while rejecting creepy-crawly insects and slimy snails – don’t you? And do any of you have any promising insect recipes, or insect-eating tales? I can look at insects going about their business without any problem by my stomach is churning just looking at the picture because it’s food. I had the same feeling yesterday. I was finishing off an apple left by one of my children and then I remembered a fly had been buzzing around earlier. I ate it anyway but for a few bites I was a bit stressed out. I think there is a very strong association in my brain between insects and flies and muck and poo. Even if I knew the insect had been raised cleanly I think it would take a lot of effort to get over that, effort that I don’t really want to expend! 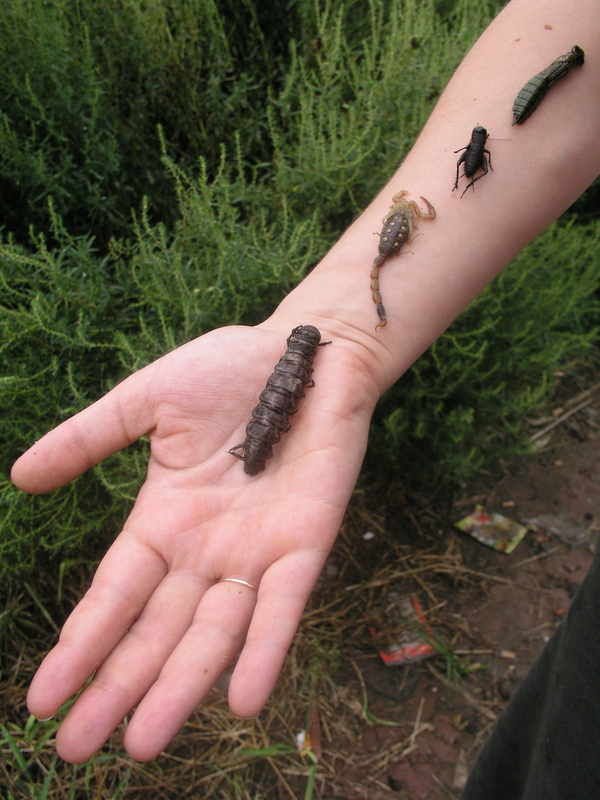 My favourites were the ‘maeng da’ water beetles and the giant wasp larvae, both done as a dip. 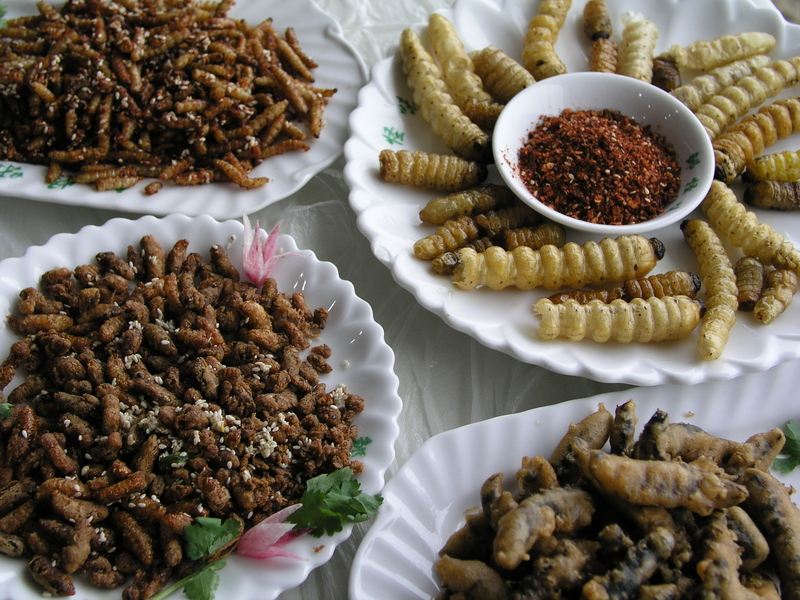 The fried grasshoppers and fried cicadas were great too, although I hated the soft ploppy texture of the dung bugs and wasn’t so inspired by the bland taste of the bamboo grubs. We foraged quite a few, but the markets and vendors have loads to choose from also. My team and I at the Adelaide Science Exchange served Richard Dawkins and 30 guests a “Phylum Feast” earlier this year. The diners were greeted by a huge plattered streetscape of “canapests” on arrival: mealworms, crickets, woodroaches… The guests were all quite receptive. I find it disingenuous, to say the least, that the U.N. recommends bugs as food for the common folk & then tags it as an environmental boon. Will the well-to-do be flambeing (spelling?) their centipedes or still sucking up steaks? I agree that the entire world, (U.S. especially) needs to reduce their meat consumption & get away from factory farming. I have no problem with eating bugs for those who choose to do so (crayfish are called mudbugs & I love them). However, my anger rises as I read that greenhouse gas reduction by eating bugs is more “doable” than rationing limousines, air travel, business travel etc. Also, are the bugs eating pesticide contaminated plants? My apologies for the rant; on a lighter note, I would be very open to trying scorpions, m’self. Particularly if they were served at the next U.N. hoopla for presidents & princes. But Fergal, in this day and age, as one of my Chinese friends pointed out, insects can actually be a sign of a CLEAN farming environment – in the sense that it hasn’t been drenched in pesticides. And why is it that most people don’t mind eating shrimps, which have whiskers and lots of little legs and so on – but wouldn’t eat a beetle? Chef Shane – unfortunately I haven’t been to Thailand, so can only dream of all those delicious bugs and grubs. I personally haven’t eaten insects, nor have I had a chance to try them prepared by someone who knows what they are doing. For me the most disturbing part of insects as food is the concept of eating the entire animal — guts, brains, and all. But if I’m ever lucky enough to go to Oaxaca, Thailand, Korea or another insect eating place I’ll seriously consider trying them. Or if I go to Washington DC’s Oyamel, an upscale Mexican restaurant, I can order tacos made with farm-raised chapulines (grasshopper) from the normal menu ( http://blogs.smithsonianmag.com/food/2010/07/09/grasshopper-tacos/ ). Or in the Los Angeles area, a restaurant called Typhoon in Santa Monica, California also has insects on their normal menu (crickets, silkworms, scorpions, and sea worms). Using insects as animal feed is definitely a promising area to explore and something that is already receiving attention. For example, the Delta Farm Press reported on a research project using insects in fish feed, researchers have examined crickets as a chicken feed supplement in the scientific literature, and the Growing Power urban farm in Milwaukee, Wisconsin is using larvae from soldier flies as feed for fish in their aquaponics system. Archived issues of the Food Insects Newsletter on-line have many more examples. Fuschia, the problem is you are trying to combat a visceral feeling with logic! I’d guess that when it hits, some chemical is gushing into my brain, the same thing that prevents me from eating stuff that really is dangerous, the same thing that can stop a person eating pork for the rest of their life after one bout of food poisoning. So even when I am perfectly aware that there is not going to be anything dangerous about a properly prepared insect, I have to actively overcome this feeling to eat it. What reward is on offer? Currently I am cutting back on meat and replacing it with veg, nothing motivates me to replace with insects instead! Also, as someone else says, there is something about eating the whole creature. For me at least, it would be the part where you don’t know what’s going to come next. If I crunch through this bit, will a sac of goo suddenly explode into my mouth? When all the legs and dangly bits have been pulled off a shrimp, you’re left with a piece of tasty, consistent flesh. I have no problem with eating insects, but I think the concern about methane emissions from livestock has been greatly exaggerated. Paul McCartney was a fine bassist and songsmith, but he’s not really a scientist. Livestock emissions are closer to three percent than the rather exaggerated figures of the ‘Livestock’s Long Shadow’ report, which includes every possible associated carbon ‘cost’ to boost the figure to eighteen percent while ignoring the associated factors of things like transport costs in the other sectors. Poor science makes for poor policy. My partner was in China researching a book. She talked to a local journalist and asked him how China had changed for the better in the last ten years. He said: ‘Meat. Now everyone can afford to eat meat.’ I get fairly short with people who think that people in poorer countries should be forced to abstain from basic things like decent food and personal transport for the greater good when they have never known a lack themselves. Ooh, and I should add that lobsters and cockroaches have an evolutionary relationship and very similar lifestyles. Yet one is considered unclean and the other exquisite. I have no doubt that eventually a whole array of insects will be systematically farmed and prepared to be sold in ways that they have the texture and taste of things like tuna and chicken etc. Molecular gastronomy has shown us how we can create flavors and textures from unlikely sources. Then, with some marketing weight behind it, we’ll see gradual acceptance. Good nutritionally and environmentally and cheap to farm, but the other major barrier will be the vested interests of Big Agri-Business and Big Food that has a lot invested in the status quo. I’ve been an environmental writer for years & don’t necessarily agree that insects are a sign of a clean environment – often, quite the reverse. Moreover, it may be daring & interesting, but IMO not a viable option for human protein consumption on a regular basis. Although I agree with Marc & Chris Gregory on several points, particularly insect use as animal feed. No one can farm insects or anything else on a minefield or in ground contaminated with depleted uranium or on real estate that is being swallowed up by rising coastal waters. I don’t mind eating insects, although I do have to turn some switch in my head before being able to eat them. I’ve eaten fried scorpions in China and I thought they tasted a bit like bacon-crisps. Not bad at all. I can really recommend them to anybody. But I cannot imagine I would ever, ever, ever prepare them myself. Ever. So it’s not the eating bit, it’s the crawling and frying alive bit that freaks me out. Maybe if we start with our children, like this dutch-colleague-blogger that served his daughter some tasty mealworms and filmed it. Because it’s just in our minds. good point about hypocrisy. The idea that the poor should eat insects to save carbon emissions while the rich swan around in limousines is unsavoury. I know that being able to eat meat has been one of the great joys of the reform era in China. But one must also remember that forty or fifty years ago, many people there could barely afford to eat any meat at all – a friend of mine remembers using a piece of fatty pork to wipe the wok, to give the vegetables a bit of flavour, and then keeping it for use at the next meal. It’s not necessary to eat the vast amounts of meat people do in the West to appreciate its flavour and benefit from the protein and other nutrients it offers. I’ve no doubt that if insect-farming becomes profitable, big business will move right in… Look what they did with organic food. Yes, but even preparing crabs, lobsters and shrimps can be a little creepy-crawly. I remember preparing some shrimps in a kitchen in Shaoxing last year. They had long whiskers and legs, and were very small and jumpy. I found it a little uncomfortable, and imagine it was really no different from preparing grasshoppers. Thanks for the book recommendation. Will definitely check it out. My dad used to work with a man who would almost exclusively eat bugs. They worked on a construction job together and at lunchtime he would sit down on the lawn, simply digging around for grubs and popping them into his mouth. Quite a resourceful guy! I’m sure he was used to getting strange looks from others as a consequence of his habits. I’d love to see some kind of insect-themed snack shop pop up around here, I’d definitely check it out. I’ve had this book for many years and read it so many times with fascination. And, maybe just by exposure, gotten over much of my initial revulsion… at least conceptually. I haven’t found the opportunity to put that to the test. But the roasted Australian wichiti (sp?) grubs actually sound good, described as crispy outside, creamy and buttery inside. And I imagine tarantulas would have meat like crabs. I was in Cambodia too briefly last year and disappointed I didn’t get the chance to find out. My daughter (11) and I ate ant eggs in a Thai salad. They were like flavorless caviar—a crunchy burst of liquid. But when I repotted a plant in my yard and found a nest of ants swarming over eggs… the thought of eating them didn’t sit so well. I’ve had fried crickets. They tasted like popcorn.